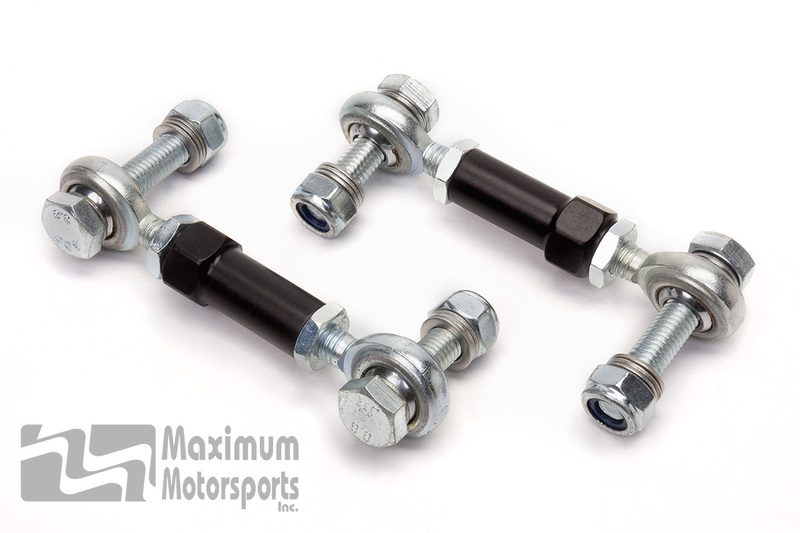 Replace the breakage-prone stock end links with MM's new Adjustable Swaybar End links. These not only replace the weak stock end links with a much stronger assembly, they also allow adjusting the length of each endlink to eliminate swaybar preload. Swaybar preload occurs when one of the end links is not the correct length for that particular installation. The incorrect length causes the swaybar to twist, resulting in altered corner weights and asymmetrical handling. An aluminum sleeve connects two PTFE-lined spherical rod ends that have left and right-hand metric threads. Directly replaces the stock end links, including hardware. Design provides enough clearance to the half-shafts for installation with an adjustable rear swaybar. Shortest possible center-to-center dimension: 3.8"
Longest center-to-center dimension (with minimum recommended thread engagement): 4.4"
You can read Maximum Motorsports' highly detailed MMRSB-94 IRS Sway Bar End Link installation instructions before purchase.